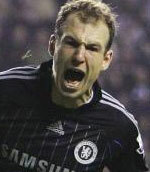 A 93rd minute goal from Arjen Robben saw Chelsea get out of jail and claim a 3-2 win at Wigan. Chelsea had surrendered a two-goal lead, as Emile Heskey's brace appeared to have earned a point for Wigan and so put a dent in the champions' pursuit of Manchester United. But Robben's shot which arrowed into the bottom corner of Kirkland's goal with the goalkeeper rooted, and not as seemed probable, Heskey's muscular menace, proved the defining factor at The JJB Stadium. Victory flattered the visitors, who despite starting and ending the match in control, were distinctly second best for the bit in between. Jose Mourinho's men started well - Salomon Kalou's shot struck the post after being only partially smothered by Chris Kirkland, but the visitors did not have long to wait before they opened the scoring. Robben's reverse pass played in Frank Lampard, who slotted his finish past Kirkland in the 13th minute. Wigan appealed for offside but Kevin Kilbane was left red-faced on a cold night - the midfielder playing Lampard onside. The hosts had been disappointing and by the time they produced a late first half rally were already two goals adrift. Kalou had skipped away from Leighton Baines down the right only for his cross to fall between two stools, before the former Feyenoord man made his telling contribution. Robben's corner was met emphatically by the head of Kalou who doubled his team's lead just after the half-hour. A scuffed attempt at a volley from Josip Skoko summed up Wigan's attacking efforts up until that point but greater belief characterised Wigan's play as the half drew to a close. And Wigan gained their deserved reward through Heskey's header from Skoko's set-piece. Chelsea were quick out the traps at the start of the second half - Lampard's shape-to-shoot sat both Arjen de Zeeuw and Fitz Hall on the floor but the finish failed to match his approach. Lampard's thoughts like those of his team-mates turned to containment, however, as Heskey's presence began to unsettle the visitors. Andreas Johansson twice profited but twice curled shots wide of the goal. Wigan had rediscovered their competitive zeal, conspicuous by its absence in the first half, and even Didier Drogba was forced into defensive action to combat Heskey's physicality. Heskey's nuisance value still gave a sniff of goal to Svetoslav Todorov, though, as the on-loan frontman hit the side netting from a tight angle. Heskey was not to be denied. After leaving an imprint on Ricardo Carvalho, illegally according to referee Mike Dean, Heskey hauled his team level on 75 minutes. Substitute David Cotterill began the move by flighting a cross from the right, Kevin Kilbane returned the ball into the goalmouth and there was Heskey to tap the ball into an empty net. Jose Mourinho's frustration at his side's surrender of a two-goal lead saw the Portuguese introduce Jon Obi Mikel and Andrei Shevchenko and Chelsea pressed back their hosts. The Latics' defence appeared to have stood firm, though, and Kirkland's only meaningful act was to tip over a header from Carvalho - only for Robben to strike and maintain the slender two-point advantage for challengers over champions.